The U.S. Department of Defense will soon be taking steps to make the department more transparent and data more readily available to the public. 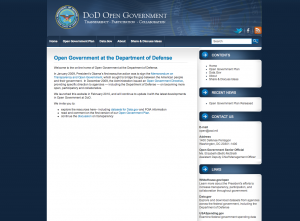 Yesterday, April 8, 2010, the DOD released their Open Government Plan detailing the efforts. “Improved transparency can enable the public to better understand goals and activities of the department and facilitate analysis of data never before shared publicly. Broader participation can serve to lower barriers between the federal government and public citizens,” said Elizabeth McGrath, the assistant deputy chief management officer, who was in charge of the Department’s Open Government project. The goal of the directive issued by President Obama back in December was to increase openness and transparency in federal agencies, and the DOD did just that. The DOD Open Government Plan took into account public input and materials department wide, from the technology sector to the legal professionals. The plan is available at www.defense.gov/open. They hope to facilitate feedback and public comments on the different sections of the plan.